Republican spokesmen this week were quick to downplay the SurveyUSA poll that showed U.S. Sen. Pete Domenici’s approval rating sinking to historic lows. But a New Mexico pollster said Tuesday that Domenici supporters shouldn’t be so quick to dismiss the poll. The poll, conducted last week of 600 New Mexicans, showed a drop of 11 percent in one month and 27 points in the past 10 months for the state’s senior senator, who faces re-election last year. State GOP spokesman Scott Darnell was equally adamant. He emailed me a couple of recent examples in which SurveyUSA showed “winners” of Congressional races who later turned out to be losers. Albuquerque pollster Brian Sanderoff said he has some real qualms about SurveyUSA’s data-collection methods. The company uses automated calls instead of live human interviews. The poll sample consists of “adult residents” — not likely voters or even registered voters. Sanderoff, president of New Mexico Research & Polling, Inc., said he recently took it upon himself to study SurveyUSA polls from the last election around the country. “They were usually pretty close,” he said. Based in New York, SurveyUSA is the only company that performs monthly tracking polls in all 50 states on U.S. senators, governors and the president. In New Mexico the tracking polls are sponsored by KOB-TV. But, he said that SurveyUSA uses the same method every month, so even if 41 percent isn’t the correct number, it shows a trend that should concern Domenici. Sanderoff said he believes the Iraq War is the main cause of Domenici’s diminishing approval numbers. 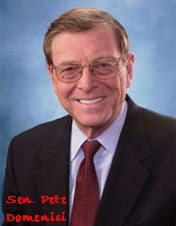 A national anti-war group purchased television and radio ads targeting Domenici’s support of the war and President Bush. Bad polls: Darnell, when asked about the Domenici poll Tuesday night said that if you believed SurveyUSA, Patricia Madrid would be in Congress today, not Heather Wilson. Indeed in a poll on the eve of last year’s general election, Survey USA showed Madrid leading Wilson by two percentage points. Wilson went on to win that race by less than 900 votes. But the actual results came well within the poll’s 3.8 percent margin of error. Another race Darnell point to was a run-off in a special Congressional election in Texas last year, where SurveyUSA just two days before the election showed incumbent Republican Henry Bonilla beating Democratic challenger Ciro Rodriguez 51 percent to 47 percent. But when the votes were counted, Rodriguez clobbered Bonilla by a nine-point margin — way outside the poll’s 4.3 percent margin of error. “They’ve had a few bad calls in some races,” Sanderoff said. “We all have.” He noted his own WIlson/Madrid poll also showed Madrid ahead. “But approval numbers are far easier to predict than elections,” Sanderoff said. Close elections, he said often are determined by who has the best organization and get-out-the-vote effort and by uncontrollable external circumstances, such as bad weather. Taking credit: One announced Democratic candidate for Domenici’s job had an immediate public reaction to the poll. In an e-mail statement Jim Hannan of Santa Fe basically took credit for the poll plunge. Actually Domenici was at 68 percent last November. In March, after the U.S. Attorney scandal broke, Domenici’s approval rating had gone down to 57 percent. And while Hannan is right that Bush’s numbers are lower than Domenici’s, SurveyUSA’s latest New Mexico poll on the president shows Bush’s approval rating at 34 percent. Please pass the elephant butter: A curious news release came out of the lieutenant governor’s office this week, and I’m betting a computer spellcheck program is the culprit. Maybe it’s time to butter up the folks at Elephant Butte. BIG NEWS! STEVE TERRELL'S WATER BILL! TERRELL'S TUNEUP: HELLO, I'M JOHNNY CASH!